We’d love your help. Let us know what’s wrong with this preview of TAG by AJ Everheart. But it wasn’t just our government, no, it was every governing body, in every country, around the globe. In an attempt to reduce overpopulation they unleashed a virus unlike any other, but they couldn’t predict what happened next. The infected became cannibalistic monsters, every trace of humanity gone. They hunt us down wherever we go. We are the They did this. We are the survivors, the ones who made it to the first anniversary of the outbreak. Our numbers are dwindling, but we have one last shot at fighting back. We just have to survive long enough to save the human race. The fate of the country lies with a lonely school girl and a city boy with a shady past. To ask other readers questions about TAG, please sign up. This novella packs a big punch in a short amount of time. There's a great plot and more than a few surprises along the way that keep the reader engaged from start to finish. Love the contrast between the brutal harsh reality of a zombie apocalypse and the sweet romance between Alex and Mia. There's plenty of gore and horror-filled moments for those who want their zombie fix but I think it's also fast paced story with lots of action and tension. It's obvious it's well thought out and planned which I liked. I hope there's more to come! I HAVENT READ A GOOD ZOMBIE BOOK IN A WHILE AND LOVED THIS. THIS BOOK HAD EVERYTHING SECRETS, BETRAYAL AND GOOD OLD ZOMBIE ACTION. MY ONLY CRITICISM IS I FELT THE ENDING WAS RUSHED AND COULD OF BEEN EXTENDED. 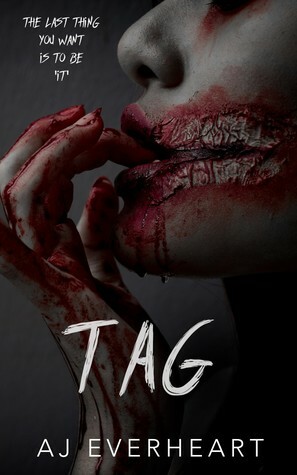 Tag is a story about Mia, Alex, and their life after the zombie apocalypse. As we read we find out how they survive and fall in love when life is at it's worst. When the book begins, Mia and Alex are strangers. They meet when Alex and his friends raid Mia's hideout for supplies. There is an instant draw between the two and together they face all the trials, secrets and lies the end of the world has brought them. The book itself I received this book from the author in exchange for an honest review. The book itself has a great story. It was well written and very hard to put down. The only thing I did not like about this book is it could of been longer. The ending felt rushed and I felt like there could of been more zombie action filler. I struggled with what I should rate this book. It came down to the content I felt it was missing versus how good the content it did have was written. In the end I went with 4 stars because I thought it was a really good read. As a zombie fan, I really enjoyed it. As usual Alice brought the goods. I enjoyed the story. I've read plenty of Vampire and Witch type book's, but this is the first Zombie book I have read and I have to say I enjoyed it. I loved the chemistry between Alex and Mia, I think that they worked well together which is shown in the story when they are planning to see what Mia's father is up to. I liked Donovan he was cool and his involvement in places helped the story. I hated Karen, she was horrible for no reason. It's not like it was Mia' As usual Alice brought the goods. I enjoyed the story. I've read plenty of Vampire and Witch type book's, but this is the first Zombie book I have read and I have to say I enjoyed it. I loved the chemistry between Alex and Mia, I think that they worked well together which is shown in the story when they are planning to see what Mia's father is up to. I liked Donovan he was cool and his involvement in places helped the story. I hated Karen, she was horrible for no reason. It's not like it was Mia's fault that their friend got shot in the leg with one of Mia's arrow's, they turned up at her place not the other way round. I thought that Leo was a lunatic, who did he think he was? and Sammy and Mia's father are stupid, did Sammy really think that Alex was going to break into a secure safe for a lunatic. Also did Mia's father really think he cold keep his little experiments on the Z's a secret forever? I don't think so. I was going to give this 5 stars as I really did enjoy it but I was disappointed in the ending, to me it felt like it ended on a cliffhanger with some unanswered questions. - Did they ALL get back to Rosehill and the Army Base Camp? - Did the cure work? - Did Anna manage to escape and meet up with the others? OMG!!!!! I loved this book! I was drawn into this book from the very beginning until the very last page that I had trouble putting it down. This is the first book I have read by this author and would love to read more. I liked the authors writing style and the book just flows so smoothly. Mia is at boarding school when the virus breaks out, everyone tries to escape but the don't get very far and Mia ends up back at the boarding school. Alex and his team come across Mia and the boarding school whil OMG!!!!! I loved this book! Mia is at boarding school when the virus breaks out, everyone tries to escape but the don't get very far and Mia ends up back at the boarding school. Alex and his team come across Mia and the boarding school while out on supply runs, but Mia has been alone for so long she finds it hard to trust but her and Alex and drawn together. Mia leaves with Alex and together they are on a journey to try and save what's left of humanity. Set in the UK during a zombie apocalypse, that the government engineered. A school girl named Mia and a guy named Alex find each other and together they try to stay alive. I've been in an end of the world/zombie apocalypse mood for a while now. So when I came across this, I couldn't wait to read it. First off, that cover is fricking AMAZING!!! It drew me in and I HAD to have more. The story didnt disappoint either. I absolutely loved it. Seeing the end of the world in a different country, was kinda awesome. The story line kept me hooked. I loved the characters. I didnt want it to end, and I'm left wanting more. So fricking good!! The rule of TAG, is dont get caugh I've been in an end of the world/zombie apocalypse mood for a while now. So when I came across this, I couldn't wait to read it. This was a fantastic read. Wow, what can I say about this storyline? It's absolutely incredible. So innovative and inventive. The author writes with so much imagination but somehow still manages to create some realism so that you feel the book is happening right now. The world building is something else and I loved reading it. The characters were great to get to know. This story has everything you could want. This book was a cover read for me. I really looked forward to a book about zombies, I haven't read many of them. Unfortunately, I expected to read to be more about the zombies than the survivors since the cover has a mouth covered in blood. This was still a good book, I just really felt that the ending left no point to the story. It was too much of an abrupt ending. This book is absolutely amazing! It will keep you on the edge of your seat the entire time. This was my first zombie apocalypse book I have read and I loved every minute of it especially the romance. The characters were also perfect for this story! This is a game of tag you don't want to be caught in but you definitely want to read this book! This is an amazing story! Not one I normally read but I loved it so much. The characters are fantastic to read about and I could just keep reading and reading about them. I was left wanting more from their story and their journey to survive. The story had twists and turns, and when thought it was going one way, it took a different turn. Definitely a 5 ⭐ read. This is an amazing story! Not one I normally read but I loved it so much. Not usually one for apocolypse stories i gace this story a go as i have read this authors other work in an alternative pen name along with the blurb and teasers drawing me. Wow i could not put it down. It drew me in and kept me on the edge of my seat. I was gasping at the twists and turns and wanting to throw my kindle out the window at some parts! Eager to read more by this author! This story was amazing! Right from the start, it pulled me in and wouldn't let go.